The JMetzger Group | Listen. Learn. Lead. Find out more about Frankie and Katie, a mother and daughter saved by Meridian Health Services. Find out how we can cover your event from every angle, whether through writing, photography, video or all three. Contact us today to discover how we can design and publish a magazine all about you and your brand. Tell us where you think you need to go. It takes an objective point of view to make tough decisions. We'll learn about you and your priorities and put our expertise to work on your behalf. It's about customizing a solution for you. It is more than the title you hold or the number of years you've been on the job. It's about inspiring excellence. The JMetzger Group has an entire team of SMOJOS (Social Media Online Journalists). We are a team of media professionals with backgrounds in digital news, television, radio, print and online media. Our specialty is in creating rich, high-impact content for websites and social media channels. This high-quality video, writing and production can also be used in commercial television, company films and other applications. We offer top-grade video news-style coverage, sidebar interviews, text, still photography and videography. Combined, these elements provide content to the client that can be re-purposed and repackaged. This digital communications package gives you turnkey content that will enhance your website presence and social media fan base. The result will increase your search engine optimization, drawing more of the key audience to your target. Over the past 25 years, Juli Metzger has been a journalist, publisher, CEO, coach, trainer and teacher. She’s been a consultant to numerous companies looking for a deep dive into their portfolios and business strategies. She’s a motivational leader who knows how to leverage multimedia communications. A former Editor-of-the-Year for the Gannett Company, she has led nationally recognized newsrooms and launched custom publications such as magazines, newspapers and specialty websites. Juli has a unique blend of specialties and expertise. She started her career as a news reporter then went on to lead news operations including small- and mid-sized dailies and was Executive Editor for Digital at The Indianapolis Star. She’s also seen the business side of the media business as president and publisher of three different newspapers and understands the balance of editorial independence and ROI. Tim Underhill has worked for network television affiliates in Rockford, Illinois; Grand Rapids, Michigan; and Indianapolis, Indiana. He continues to keep up to date by freelancing for various networks. Tim’s work has appeared several national and regional networks including, ABC, NBC, CBS, CNN, ESPN, The Big Ten Network and FOX. 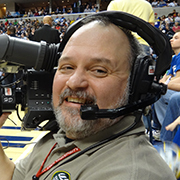 He has covered the Indianapolis 500, Brickyard 400, NBA playoffs, Pan Am Games, NCAA championships, the World Basketball Championships, NFL Monday Night Football plus other college and professional sporting events. Tim’s work has earned awards from many of those same organizations including NPPA, AP, and the Emmy Awards. Host of Indiana Public Radio's Indiana Weekend, John Strauss is a college journalism instructor and longtime Indiana reporter who likes finding stories off the beaten path. He’s a former AP correspondent in Indiana, Tennessee, Kentucky and New York, whose last professional assignment was with The Indianapolis Star as a digital-news and weekend city editor. John now teaches journalism at Ball State University and serves as adviser to the student-run Daily News. John Metzger is a problem-solver, whether it's in his woodshop building furniture using re-purposed material, designing a uniquely targeted ad, or trouble-shooting pre-press production issues. An expert in Adobe InDesign, Illustrator and Photoshop, he's a builder and an artist first and foremost. John has worked in media across three states in capacities including editorial, sales, marketing and production. He understands the processes from concept to distribution. Maria Strauss is a photojournalist with experience in photo, video, print journalism and television production. She's worked at two newspapers and loves fashion photography. Maria begins graduate studies in the fall. Designer by day, husband by night, Adam Sturm is the founder of Seegull Media, a full-service media and graphics company with focus on design, photography and video product services. After getting his Bachelor's of Arts in Telecommunications at Ball State University, Adam moved to New York City where he honed his talents as a photographer and videographer. He moved to Indiana when he met his wife, Jennifer, and is based out of Indianapolis. Chris Bergin, an award-winning editorial and corporate photographer based in Indianapolis, has a degree in photojournalism from Ball State University in Muncie. His work has been published in Sports Illustrated, People Magazine, MSNBC.com, USA Today, New York Times, Washington Post and Indianapolis Star. Some of our Clients who love being with us! Meridian Health Services has a limited marketing budget so we’re always looking to leverage our existing signature events. We need to educate as many people as possible of our mission and programs. SMOJOS helped us take an existing event and showcase it in a whole new way to largely new audiences via social media.The content was crisp, clean and professional, but most importantly, it was immediate and relevant. Not only did the content work in the short term but we own it and are able to re-purpose it for use on our website and other platforms. What a great asset. The New Castle-Henry County Chamber Magazine highlights so many great things we have going on and does it beautifully in both style and prose. I can’t wait to see the next issue. The JMetzger Group understands the media landscape and has been able to create content that our audiences enjoy. By choosing to be in JMG’s publications, we not only know we’ll be seen, we know we’re in good company, too. And, consequently, Meridian gets great exposure to the right people. We wanted to increase our presence in the social media space but were uncertain on how to best get there. smojos showed us a way to better utilize Twitter and Facebook. Our followers and “likes” increased immediately. We have the content, including stories, photos and videos that we can reuse throughout the year. One of the best features of the smojos work was that the content was provided within hours of the event and they updated Facebook and posted to Twitter throughout the evening. They provided a great solution to us. We have been extremely satisfied working with The JMetzger Group over the past several months. They approached us with an excellent vision for the new chamber magazine in our Henry County market, and we gladly took a leadership position in the publication. John provided customer service personally and delivered on every promise. The graphic quality, writing quality, and production quality of the publication were all exemplary. We will definitely continue our relationship with The JMetzger Group! Do you have a plan? Or are you overwhelmed with the demands that face you now? Whether it’s the longview strategic plan you’re looking for or a shorter-term directional need, I can help. ContactReach out! We'd love to chat! We are based out of Yorktown, Indiana, but we work with companies all over.